World Poetry Celebrates Rising Star Francesco Antonio! 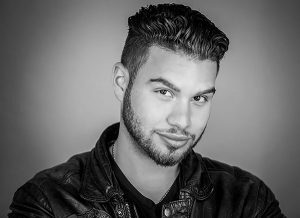 Ariadne’s Notes: The World Poetry Café Radio Show CFRO 100.5 FM welcomed the amazing young actor Francesco Antonio calling March , at 1:10 PM,PST from Toronto with wonderful advice for a young actor trying to get acting parts in Kenya. Antonio’s advice is to get a video camera and put his work on the internet, get a following and then work toward getting the parts that he needs to get ahead. Francesco said: “The Internet is your best friend.” Also on the show was an e-poem from the wonderful poet from Morocco, Monsif Beroual with his powerful poem History Room and another World Poetry Day Poem by Steven Fortune . The acclaimed author Joy Kogawa called in from Toronto about her launch of a AR app from one of her novels recounting Japanese Internment Camps. I will be featuring her separately. Music by World Poetry Music Director and Composer Yoshifumi Sakura and by Christopher Jentsch with his new CD. He will be on the show next week. With thanks to our World Poetry Café radio show, now celebrating 21 years. Our team: Ariadne Sawyer, Host and producer, Victor Shwartzman, super engineer and Sharon Rowe, special volunteer and author whose Big Bessie Stories are featured on each show. LISTEN HERE FOR THE SHOW! Canadian actor, Francesco Antonio! He’s starring in the new upcoming web-series on YouTube Premium titled, WAYNE. The show is written by Deadpool writers, Rhett Reece and Paul Wernick, and also stars Mark McKenna (Sing Street, Kat and Alfie: Redwater) as the titular character, and Ciara Bravo (Big Time Rush, Red Band Society). The ten-episode series premiered worldwide last week and follows fifteen year-old Wayne who sets out on a dirt bike with his new crush Del to take back the 1978 Pontiac Trans Am that was stolen from his father before he died. It is Wayne and Del against the world. Francesco also has other great projects he’s currently working on that he can talk about on the show in addition to WAYNE. In fact, he just wrapped production on the highly anticipated WHAT WE DO IN THE SHADOWS TV series, and a short film called LOVE, SARAH, in which he plays the lead character. Francesco Antonio has landed a recurring character role on YouTube Premium’s new original comedy series, Wayne, in what is slated to be YouTube Premium’s “biggest breakout show of 2019”, according to Bleeding Cool. He will work alongside Deadpool writers, Rhett Reece and Paul Wernick, and star opposite Michaela Watkins. Wayne premiered at this year’s Tribeca TV Festival (2018). The ten-episode series will be premiering worldwide on January 16, 2019 on YouTube Premium. Born and raised in Toronto, Francesco has received nominations in Spain for Best Actor at the Barcelona Planet Film Festival for his role in Addiction (2018). Most recently, Francesco made a splash in Las Vegas where he received four nominations from the Action On Film Festival, winning the G.I.F.T.E.D award, making it the first time the award was given to an actor in the festival’s history. 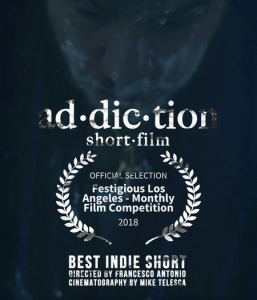 Francesco was also nominated in the Hollywood Dreamz International Film Festival in Las Vegas for Best Actor (Addiction, 2018) and Best Young Performer (The Joke Thief, 2018) but was awarded the prestigious, Lewis Mitchell Award for Acting for his work in Addiction. Francesco has already worked opposite legends such as Franco Nero, Danny Aiello and Giancarlo Giannini in The Neighborhood (2017). Francesco just wrapped filming for What We Do in the Shadows (2019) for FX network with Jermaine Clement. Francesco also played a memorable roll in the hit show Bad Blood (2017-2018) starring alongside Kim Coates. In 2019, Francesco is set to star in the short film Love, Sarah. The 10 episode series is written and created by Shawn Simmons. The series is executive produced by Rhett Reese and Paul Wernick (Deadpool, Zombieland), Greg Coolidge (Ride Along) and Kirk Ward. Iain B. MacDonald (Episodes, I’m Dying Up Here, Shameless) directed the pilot. This entry was posted in Ariadne's Notes, E-Poets, Featured actors, Featured Filmmakers, General and tagged Author Sharon Rowe, Christopher Jentsch, Francesco Antonio, International Peace Award Ariadne Sawyer, Robyn Mogil (TaRo PR), Victor Schwartzman on March 25, 2019 by Ariadne.